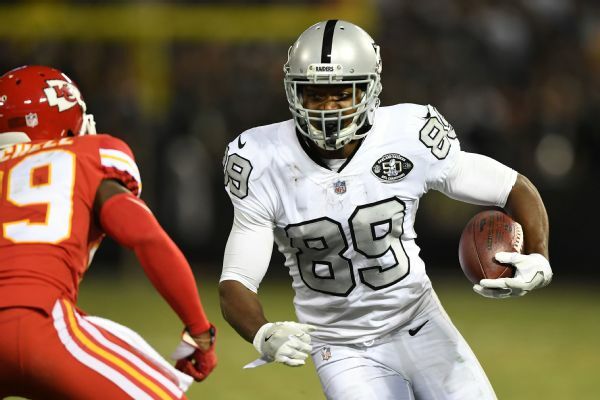 ALAMEDA, Calif. --Raiders receiver Amari Cooper practiced in a limited fashion for the second day in a row Saturday, and the two-time Pro Bowler was listed as questionable for Monday's game at the Eagles. "He's done pretty well," Raiders coach Jack Del Rio said of Cooper. "... There's a good chance we'll have him." Cooper has missed two of the last three games after suffering a sprained left ankle Nov. 26 against the Denver Broncos-- he also suffered a concussion on the hit by Darian Stewart--and re-injured it vs. Kansas Cityon Dec. 10. He has one catch, for nine yards, over the past month. "I just want to have two good games," Cooper said about finishing out the season. "It's been frustrating in that regard. Obviously, you want to be out there and play. This is my job, you know what I'm saying? "To be hurt and then to feel like you're ready to play, to put in all that preparation and all that treatment, and go out there and get hurt again, it can be tough a little bit mentally, but it's football. You risk getting hurt every play out there." Cooper, who began his NFL career with consecutive 1,000-yard receiving seasons, has 42 catches for 499 yards and five touchdowns in 12 games, though he is averaging a career-low 11.9 yards per reception. If you take away his game against the Chiefs on Oct, 19, when he had 11 catches for a career-high 210 yards and two touchdowns, Cooper has just 31 receptions for 289 yards and three TDs, with an unseemly 9.3 yards-per-catch average. He entered this season averaging 78.5 catches for 1,111.5 yards (14.1 ypc) and 5.5 touchdowns per season. Meanwhile, the Raiders also listed cornerback David Amerson, who has been out since Week 7 with a left foot injury, as doubtful to play at Philadelphia, with defensive endMario Edwards Jr.(ankle) and defensive tackle Treyvon Hester (ankle) both out. "I don't know what to say on that one," Del Rio said of Amerson, who had a cap number of $8.5 million this season and is due $6 million next year. "I have to trust the trainers and the doctors to do their thing with him. Honestly, I feel like I've been waiting forever. It's been a while. Little bit frustrating because he's one of our better corners. To not have him, a little bit frustrating."